Many find becoming a mother to be a rewarding and joyful experience — sadly, there are others who think the complete opposite. 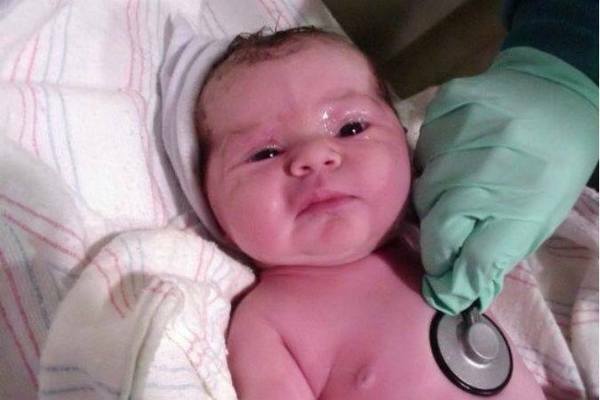 This has led many new mothers to take some extreme measures after giving birth. Denis Saranzev works as a security guard at a factory in Russia. He’s on patrol every day making sure everything is ok around the premises. One day he was doing his regular round when he suddenly heard a strange sound. He thought he could hear a baby crying in the woods and decided to see if what he heard was actually true. The man followed the sound, which led him to a ditch. Amidst the mud and trash, he noticed a tiny arm sticking out. He moved the garbage out of the way and saw what appeared to be a tied-up plastic bag. He opened the bag and, to his horror, discovered a little baby girl inside. Based on her size, he guessed she was only a few days old. She was covered in mud, dirt as well as insects and ants. You could clearly see ants eating off her eyes and more ants creeping into her ears. The poor thing was in a terrible state. She was immediately taken to the hospital and Denis contacted the police, asking them to meet him there, URA.ru reports. The ants had made their way deep into the baby’s ear canals and her eyes were full of puss. When at the the hospital, medical staff estimated the baby’s age to be roughly five days. Her survival was seen as a miracle. She was named Kristina. It wasn’t long before the police caught Kristina’s biological mother, 22-year-old Olesja. Olesja was arrested. She alleged that she had been abused and raped but when the police asked for more details about the abuse, she broke down and told them the truth. Olesja simply hadn’t wanted to keep the child and had left her in the woods to die. Eventually, the police also located the baby’s dad, Andrej. At this point, the story was all over the news, and the baby’s father had read it. He hadn’t, however, imagined that it could be his own very daughter. The man had no idea that he had even become a father. Andrej had had a brief relationship with Olesja. Their relationship ended when she got pregnant and told him she would abort the child. That’s the last he had heard from her. As soon as Andrej heard the news about his baby girl, he rushed to the hospital to see her. At the hospital, a DNA test confirmed that Kristina was indeed Andrej’s daughter. He didn’t think twice about taking her home with him and his wife, Tatyana, had no objections to an addition to their little family. Olesja was given a 2-year conditional sentence. Some think she got off too easily considering all the hurt she caused an infant, not to mention her own child. Kristina sure had a guardian angel looking after her. She is now living with her father and stepmother who loves her dearly – much more than her biological mother ever did. I can’t imagine anything worse than people inflicting pain on an innocent child. Luckily this case had a happy ending. If you ever hear or see anything which might make you think a child is being abused, then never hesitate to contact the police. It’s our duty as human beings. Please consider sharing this story if you agree!